Slideshows are an excellent way to display photos, videos or any other type of content in front of an audience. More often they are used by photographers of all ranks and PC users to organize multimedia footage into beautiful clips for online sharing or YouTube upload. You can’t do without a good slideshow maker which outputs slideshows in a video format. We collected for you one of the best tools which will help create amazing slideshows free and easily. 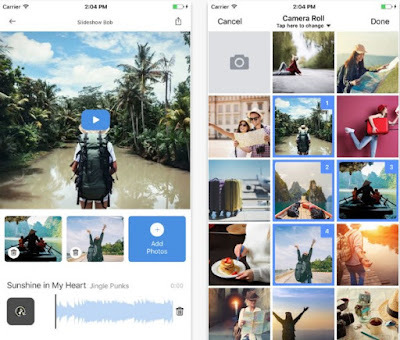 Slideshow Bob is one amazing editing app for everyone that needs a tool to create slideshows importing photos or videos from their iPhone. A perfect app for making a video about your journey, birthday, past event and being able to share it with your loved ones in no time! Slideshow Bob is very easy to use – in only three steps you will create your slideshow. Just choose the pictures or videos, select a track and save the slideshow to your library. Slideshow Bob will help you to create the perfect slideshow and it will be very easy – simply creating a slideshow by your standards. The app allows you to link your iTunes music and choose a track and access your library for choosing numerous photos for your slideshow. This app also offers you iCloud and SmartAlbums photo support, giving you the most secure and efficient slideshow experience ever. When you’re done editing your video, all you need to do is save it directly to your library or simply share it on Facebook, YouTube, etc. Create a video with delightful memories and share it with your loved ones – download Slideshow Bob on the App Store!